Ayn Rand wrote three full-length novels during her life and I've read them in reverse order to when she wrote them. I started with Atlas Shrugged, see: https://hpanwo.blogspot.com/2012/02/atlas-shrugged-by-ayn-rand.html, then The Fountainhead, see: https://hpanwo.blogspot.com/2013/03/the-fountainhead-by-ayn-rand_29.html; and now I've finished with her debut novel We the Living. The book hit the shelves in the USA in 1936 after Ayn Rand struggled for three years to find a publisher. At the time she was a penniless Russian immigrant living with her American relatives and, despite her phenomenal intelligence, she had yet to master the English language. The book is fictional and not an autobiography, but it is set in the world she lived in when she was about the same age, in her late teens, as the book's pivotal protagonist, Kira Argounova. Kira is named after a character in a story Rand loved, a man called Cyrus who was a heroic English adventurer and explorer in Africa, a person similar to H. Rider Haggard's Allan Quartermain. Kira is spirited, ambitious, individualist and solitary. She is a brilliant science student at college and longs to be an engineer. Unlike the characters in Rand's other books, such as Howard Roark and Hank Reardon, her professional interest is not explored in detail. There is only one scene about it in which Kira is staring in fascination at a building site. The problem is that Kira is living in a society that despises her qualities. Her home is the city of St Petersburg in 1922, in those days called Petrograd. The Russian Civil War has just ended and the country is devastated. Her father used to run a textile mill, but it has been appropriated and nationalized by the emergent Soviet Union. The same thing happened to the author's father, except with her father it was his chemists shop. Her family have to move into a house with several other families. Luckily Kira's aunt lives nearby with her family. The family is split over politics with Kira's two cousins taking opposite views when it comes to socialism. Their father, her uncle, used to be a furrier and he is a staunch anti-Soviet "white". This leads to the family falling apart, especially when one cousin is sent to a prison camp in Siberia and her husband is sent to a separate one. Their parting is an incredibly poignant scene. The other cousin, the pro-socialist one, refuses to try and overturn the decision to incarcerate them separately. Things are little better for Kira's side of the family. Like almost everybody else in Petrograd, they are extremely poor. There is very little to eat and the staple diet is sunflower seeds, so much so that the shells fill the gutters of the street. All their heat comes from a small mass-produced firebox known as a "bourgeousie" and the only cooking appliance is a portable gas stove called a "perigas". The electricity supply is intermittent and most people don't have it. They also eat millet and linseed oil. Luxury items like makeup and nice clothes are almost unheard of and are coveted fiercely on the rare occasions they are smuggled into Russia. Kira's aunt dies of tuberculosis. Rand describes the cold winter days and nights in the city in great detail. The pavements are covered by wooden blocks. Homeless people freezing, prostitutes on every corner, open fires at every crossroads to try and keep people warm. Things go from bad to worse when Kira ends up in a terrible love-triangle. She meets a handsome young fugitive called Leo and they fall in love. They are both treated very badly by the socialist government because of their pre-revolutionary upper-class backgrounds. Not being "noble proletarians" they are expelled from college. Kira ends up working as a tour guide. Leo is stuck down by tuberculosis and Kira, desperate to get him treatment, manipulates a man called Andrei, an admirer of hers from college, to pay for the treatment. Andrei loves her and she pretends to love him so she can siphon off money to Leo's doctor. However when Leo has recovered, he comes home from hospital a changed man, miserable and nihilistic. He joins a gang of criminals running a smuggling and black market business. When Andrei finds out what has happened he commits suicide. He is buried with pomp and ceremony as a Soviet hero, but it's all a sham with mourners just going through the motions. Only Kira truly grieves for him. After the funeral she then is confronted by Leo announcing that he is leaving her to live with one of the members of his gang, a deceitful and greedy old woman, who interestingly is also a theosophist, a follower of Helena Blavatsky. He knows he means nothing to her and will be just a kept gigolo, but he doesn't care because he is so full of depression and self-loathing. Kira then tries to break out of Russia, but is shot by a border guard. She does not die straight away and carries on walking and then crawling through the snowy landscape at night until she succumbs to her injury. It's a very moving final scene. We the living is very different to Ayn Rand's other two later novels. To begin with it is much shorter, probably less than a quarter of the length of Atlas Shrugged. It is also a tragedy, very dark and pessimistic, while the other two are triumphal and confident. This must come from Rand's own experience as a Russian exile, her memories of her family's suffering and her passionate opposition to collectivism. On the other hand, Kira's fate could be interpreted as a hymn to the human spirit. She died because she could not bear to live a false and zombified life in a society that hated who she truly was. Her family all ended up surrendering and complying; Kira refused. This explains the title; who really is dead and who is really alive? Her family may well have enjoyed physical existences far longer than Kira's, but these existences were devoid of their true selves, and so were not real lives. So maybe it was the other characters who were in fact killed and Kira who truly lived. Interestingly the book's Italian translation was promoted by Benito Mussolini and the first film adaptation was made in Italy without rights, until somebody pointed out that the book is not just anti-socialist; it is also anti-fascist. After that it was banned and the film only survived on bootlegged reels. Rand herself adapted the story into a play. Like Rand's other books we see a very well-developed and intimately described array of the most hateful antagonists. Nobody can make bad guys like Ayn Rand. There are the Communist Party loyalists like the pompous and corrupt Pavel Syerov and his bombastic and obnoxious wife "Comrade Sonia" who was also a bully at Kira's college. There is Morosov, the weak and stupid gang-leader who flatters and bootlicks his feet under the tables of the Party elite to hawk them black market goods. Rand spends a whole paragraph describing his ugly face with its weird shaped nostrils. We the Living is reminiscent of George Orwell in several ways. The difference between people's real lives, thoughts and feelings and those they are supposed to have as dictated by the Soviet state. We see this especially at Andrei's funeral. Some aspects remind me of Animal Farm, particularly the descriptions of the Communist Party leaders. They are decadent, self-indulgent, hedonistic and wasteful. The ruling classes are surprisingly similar in their behaviour and outlook regardless of whether the state is socialist or capitalist. The difference is that the socialists are hypocrites because the preach compassion and equality. At one point Kira asks Andrei outright: "Where do they get all the opera tickets, that champagne and caviar?" This is when the average Russian in the street is feeling their family with sunflower seeds. Russia is a nation of extremes, as much today as it was when We the Living was set. Now, almost a century after the fictional characters of the book suffered and died, Russia is entering an era of great opportunity and has grown into a powerful force for good in the world. This can be seen in the Ringing Cedars of Russia books, see: https://hpanwo.blogspot.com/2009/11/alternative-view-3-part-3.html and the way President Putin has resisted the dictate of his globalist lords and masters, for example see: http://hpanwo-voice.blogspot.com/2015/08/russia-disclose-ufos-or-we-will.html. During both the early and late decades of the twentieth century, there were two major attempts to harness the world's biggest country to the agenda of the Deep State and both failed. It began with the murder of Grigori Rasputin and the Bolshevik Revolution, see the background links below, and ended with the fall of the USSR and the attempt to turn Russia into a cardboard cut-out Illuminati-occupied Western social democratic republic. Russia would have been in the European Union by now if things had gone to plan. Today the Russian bear is refusing to be tamed and this has resulted in a massive backlash, see: https://hpanwo-voice.blogspot.com/2018/03/institutional-russophobia.html. Ayn Rand did not live to see most of this process take place and indeed, she never truly understood the forces that were manipulating her country of origin. 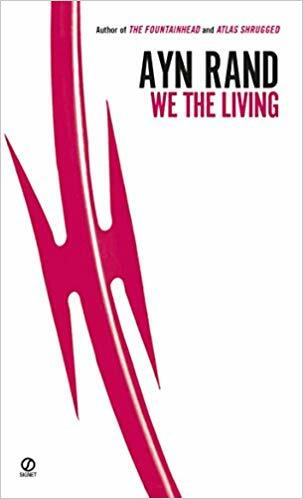 However We the Living is an interesting and heartrending insight into the painful shadows of her early life. See here for more information: https://hpanwo-radio.blogspot.com/2016/12/programme-218-podcast-rasputin.html. Loved your book reviews. I am currently in the middle of Atlas Shrugged. I think Rand was an amazing writer, probably one of the best. I certainly intend to read her other two books in time. Hi Jewels. Thanks for the comment and I'm glad you like my reviews. Atlas is a great book, and it's not easy to read, but worth the effort. I preferred The Fountainhead, but I've got a lot out of all three of Ayn Rand's novels. Hope you enjoy the rest of this unique literary experience!